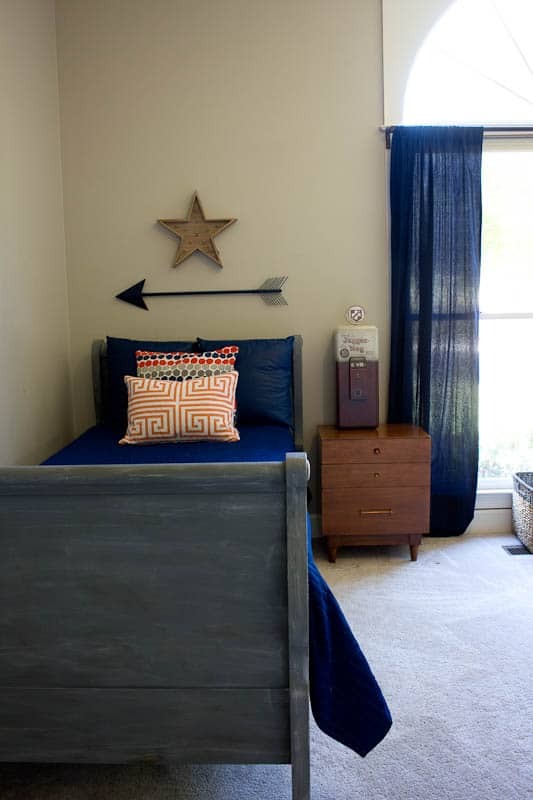 Filed Under: Before and After, DIY Tagged With: room makeover, Savvy Apron, teen boy's room. 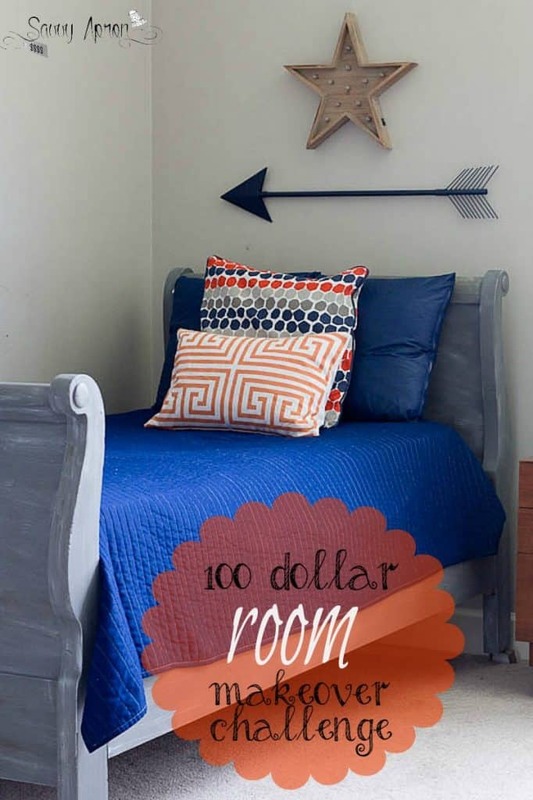 I am so excited to show you the room that I created for the $100 room makeover challenge-teen boy’s room. 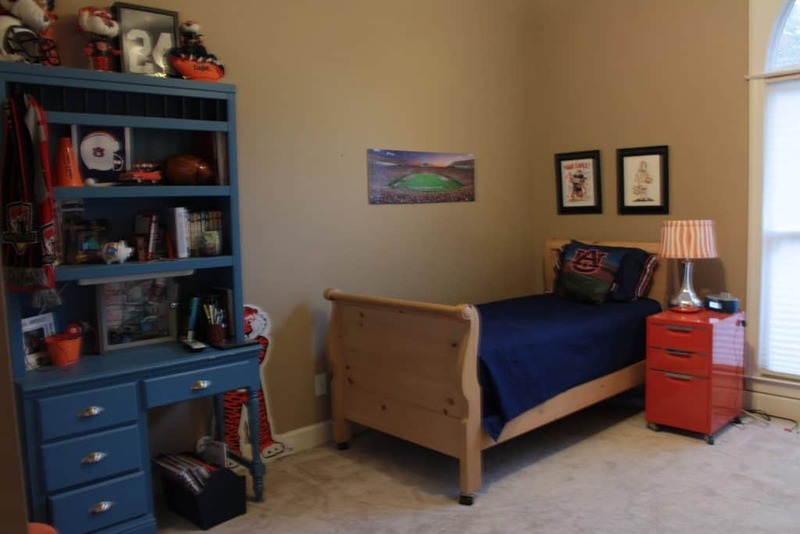 My son is a huge Auburn fan, and his room has been decorated in his team colors since he was 8 years old. He is getting his driver’s license next month so he needs an updated room. Can I just stop and say that I can not wait for him to get his license. I had him when I was forty and my daughter was 14 years old so I have been driving someone to school since 1990. That’s 26 years straight! On to the room… The first thing I did was paint the room with the paint that we used to paint the entire interior of our house. It is Revere Pewter from Benjamin Moore. I found this sleigh bed at the thrift store 12 years ago, and it is still in great condition. I painted the bed with two 99 cent jars of Valspar paint in the color Desert Storm. I try to purchase several colors when Lowes has their samples for 99 cents. I added some chalk mix that I received free from Diva of DIY , and I was very pleased with the results. I dry brushed a light gray paint that I had over the Desert Storm for a Restoration Hardware look. The step by step photos and directions are included in this link. I can’t stop staring at this bed! I love it! I found all of the pillows at the thrift store for $9 total. I had this white Ikea chest in his nursery when he was a baby. I found these pieces of wood in one of my favorite places to shop, the neighborhood burn pile at our lake house. I grabbed several pieces and gave them a good cleaning. I cut the boards and glued the boards with wood glue onto the drawers. I do not recommend doing this to a chest if you have small kids because it added weight to the drawers and could fall over very easily. We know to only open one drawer at a time but I would add something that is not heavy next time. I wanted to cool shelves for above the chest. I had two pieces of wood that I brought home from renovating our lake house. I painted them black but I needed something to hang them with that was different from anything that I had seen. I took my husband to Lowes and he came up with using chains to hang the shelves. 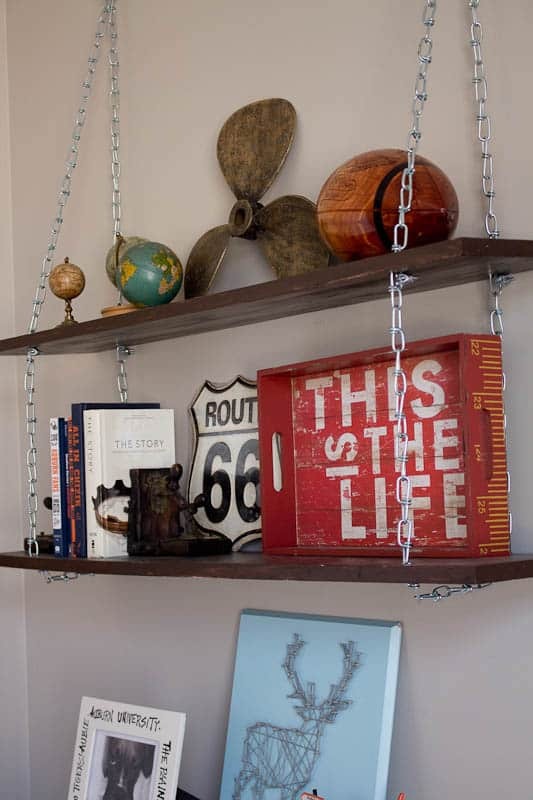 You can see how we made and hung these shelves in this post. I decorated the shelves with items he already had and few things I took from other rooms in my home. 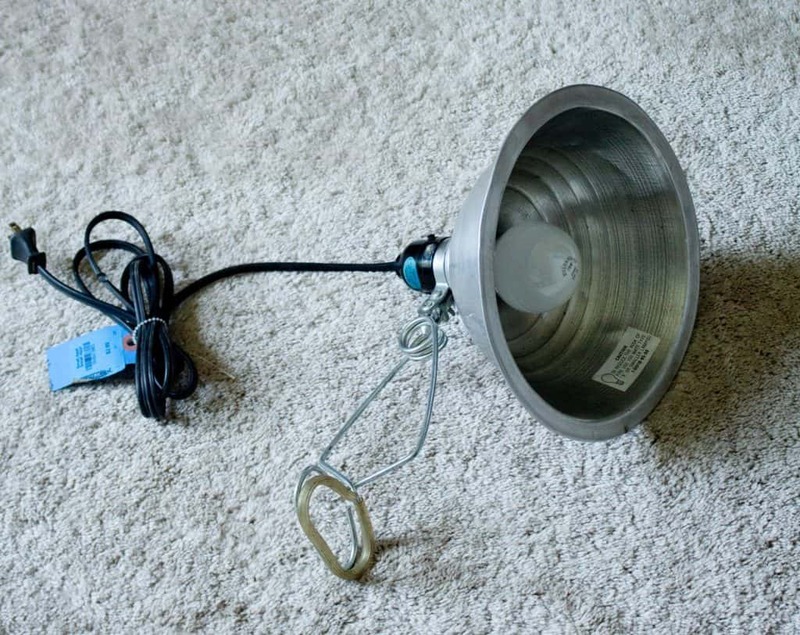 I wanted a tripod spotlight type lamp like I had seen at Dot & Bo and Restoration Hardware so I went to the thrift store in search of something to make one with. 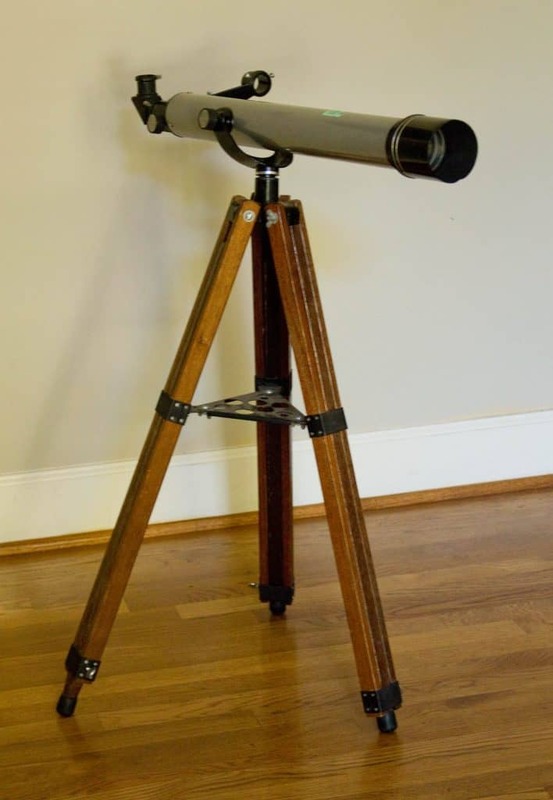 I found a telescope with the stand that looks exactly like the lamp I wanted. I went searching for something to make a spotlight with. I found this clamp lamp and all I did was clamp it on the tripod stand after I removed the telescope. You can see the post here. The total lamp cost was $9. 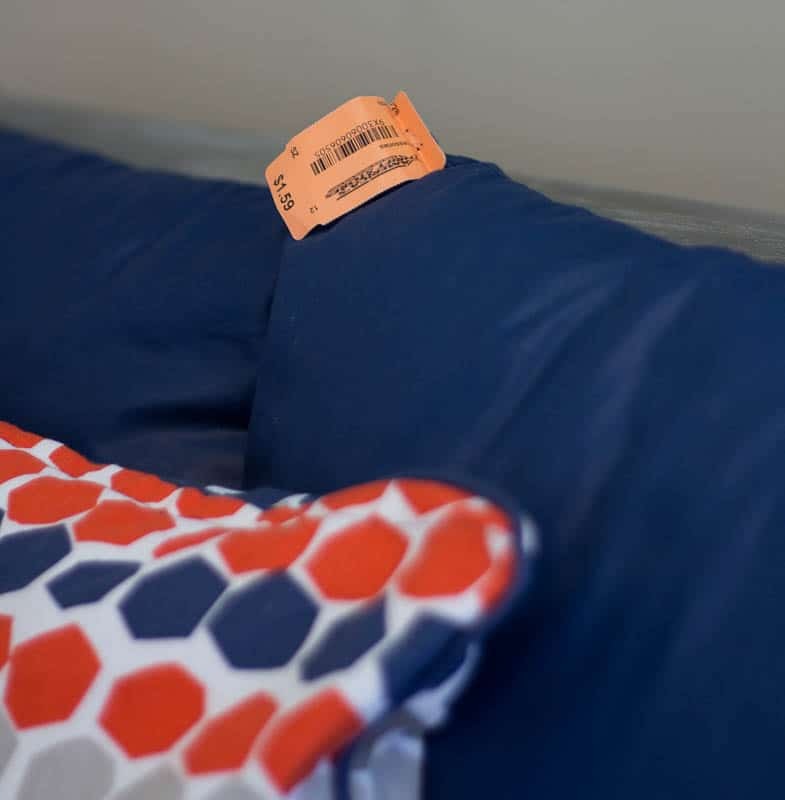 I purchased the midcentury modern chest and night stand from the Thrift Store for $38 for both pieces, and they still had the old furniture tags attached. I paid $10 for the letter “C'” on the wall. I purchased the mirror for $15, and I brought the deer picture from our lake house to use in his room. 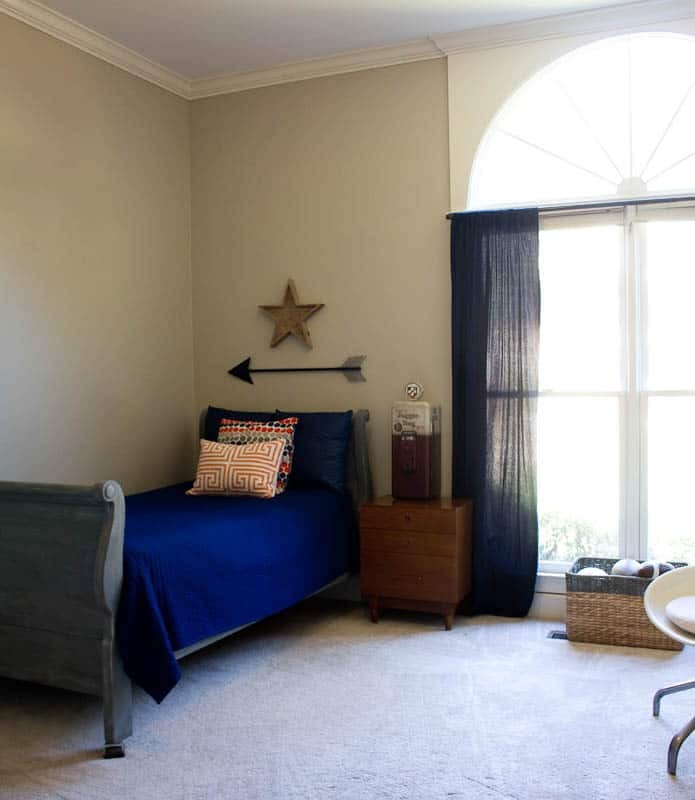 I am so glad that I chose my son’s room for the $100 room makeover challenge-teen boy’s room because he loves it so much! Don’t forget to check out the other rooms! I love how the bed turned out! Great job! Your son must be thrilled with his room makeover! It looks great! He’s a lucky boy, his room looks so great! The bed is gorgeous now and I’ve loved that lamp since the first time I saw it show up Pinterest. You have mad skills for spending little money and getting big style. I think our local thrift stores pale in comparison to the stuff you’ve found. Great job mom! This turned out so great!!! What a transformation! 😀 Cheers! This room is a perfect balance of color and industrial, fun elements. Great job on your budget too. I am sure your son loves his new space. Great transformation, especially love the hanging shelves. 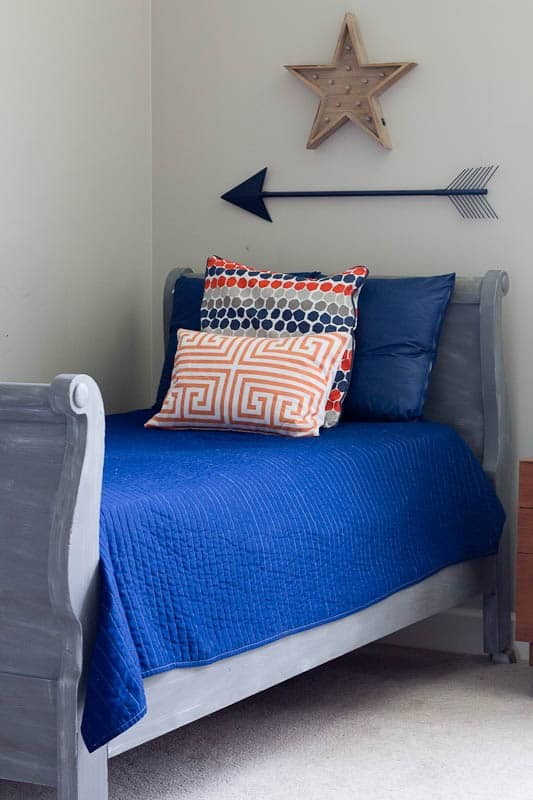 Oh my gosh…I love the colors of this room and all the awesome details you included. The light was brilliant and those shelves are amazing. Great job on your one room makeover and I am sure your son loves it too. LOVE the shelves, and that indigo blue is all the rage these days!! Beautiful job!! Wow!!! That room looks AMAZING… I love every detail of it! My favorite is that lamp! The bedroom makeover turned out really well. I bet your son loves the new grown up look. I love how ou painted the bed. What a great room for a teenage boy!! I can see why he loves it, those shelves and that lamp, oh my!! This telescope you found was amazing!! I love the clamped on light, it’s such an awesome unique piece! Way to flip this room for under $100! Wow!! I am impressed. I love the lamp!!!!! Sherry the room is a dream! 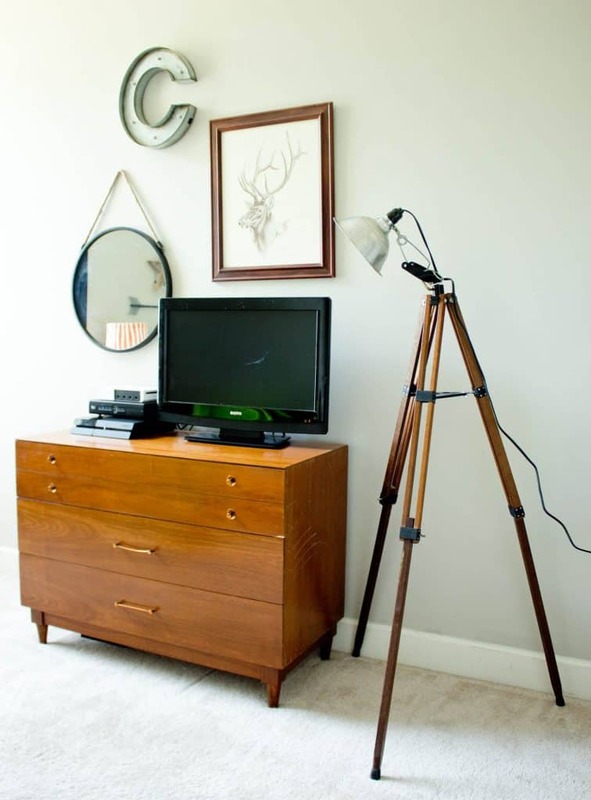 I love all the details, the lamp of course, and the decor is perfect for a teenage boy! 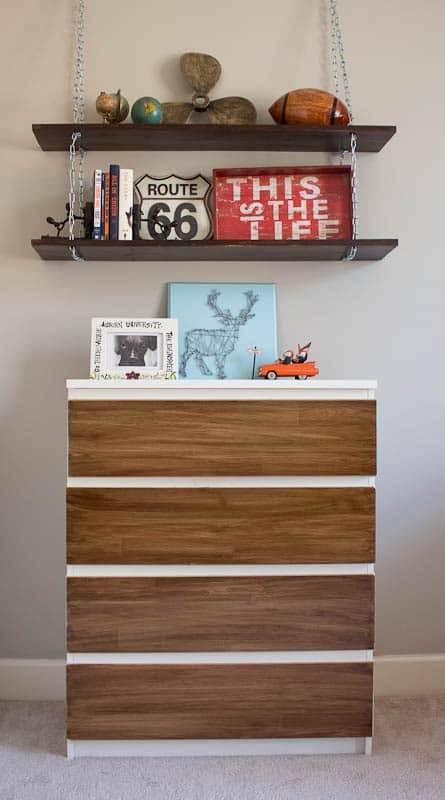 That Ikea dresser is so so beautiful, oh my and not to mention the bed! You did an amazing job, making this room so cozy and cool at the same time! 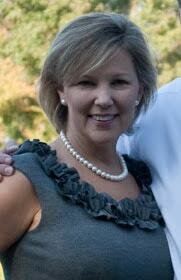 Oh my goodness Sherry! 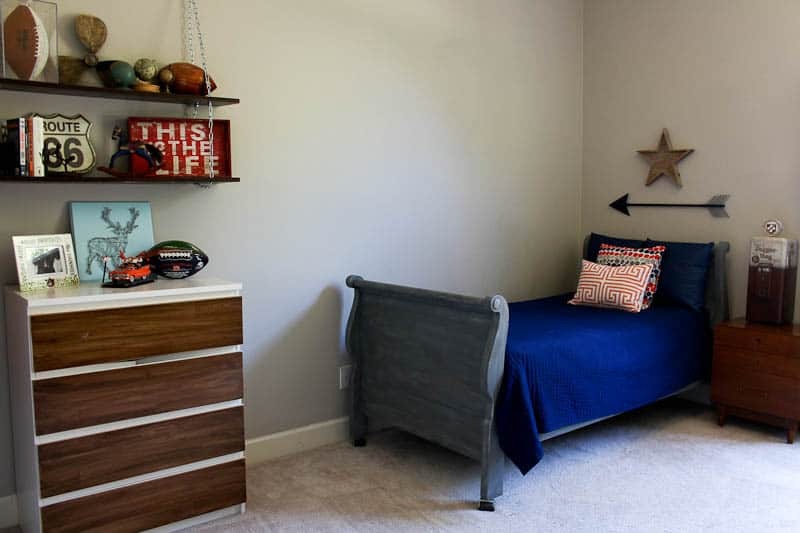 Your son’s room turned out amazing! I have an old telescope similar to that one in my basement. Never sure what exactly to do with it but absolutely love the idea of turning it into a lamp. Might have to give it a try!